Luxury Home Located in an Aspen Grove/Incredible Views of Mt. CB, Great Decks, Gourmet Kitchen! If you are looking for a fairy tale setting in a beautiful aspen grove at the base of Mt. 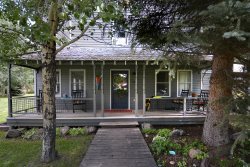 Crested Butte with incredible views and outdoor space, then look no further! Peakview is one of those special homes that your family will want to return to again and again. Pull into the large driveway and immediately your cares melt away. Located on a quiet street at the base of Mt. Crested Butte this spectacular home boasts 4 bedroom, 3.5 baths, a heated garage, multiple outdoor decks with outdoor furniture, and a great fire pit looking straight at the mountain! Step into this mountain home and you get the feeling you are in a luxury tree house! Of course this tree house comes with a gourmet kitchen, 4 bedrooms, spectacular decks, and a cozy fireplace! Walk up to the front door and enjoy the unobstructed view of Mt. Crested Butte right from the front door and the flagstone patio with fire pit. Entering the main level of the home you step into the great room with vaulted ceilings and beautiful beam work. Cozy up to the wood fireplace or step out onto one of the outdoor decks and enjoy a morning cup of coffee or a great dinner with the family. The comfy living room furniture is perfect for an afternoon nap or watching the game on the TV. The gourmet kitchen has enough room for all the cooks and opens up to one of the outdoor decks for breakfast al fresco. The large round dining table insures that everyone is part of the storytelling at the end of the day. The master suite is on this level and boasts a king bed, vaulted ceilings, and it's own small private deck. The master bath has dual vanities, a large shower, and jetted tub. Should you feel the need to do laundry there is an oversized laundry room just off the entryway on this level as well. Downstairs you will find 3 bedrooms, one with a king bed and en-suite bath, one with a queen bed and en-suite bath, and a bunk room with three twin beds and access to it's own private deck. The bunk room shares the bath room with the king guest room and has access from the hall. You enter the garage from this level and trust us, a heated garage for those chilly winter mornings certainly is handy! So feel like a kid again in your own luxury tree house! This time with room for the whole family!